Note: this game is endless, devoid of interaction and has no win condition. 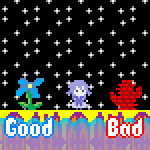 One of my favourite KotM games, put on your make-up in the dark, painstakingly recreated in WarioWare D.I.Y. If you can't play the game, watch the Vine! Only available in .mio format, unless you want to track me down in person (probably across continents).